The $50,000 Stella prize has been awarded to Vicki Laveau-Harvie for her memoir The Erratics. This is the first time a memoir has won the Stella and the second time a debut author has been awarded the prize in its seven-year history. The Erratics tells Laveau-Harvie's story of returning to her ageing, estranged parents halfway across the world and the conflict of loyalty, love, obligation and damage that ensues. 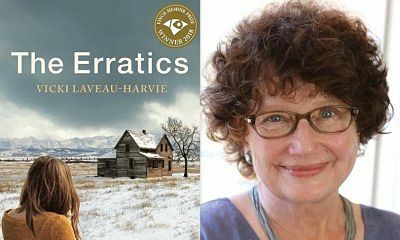 "Set against the bitter cold of a Canadian winter, Vicki Laveau-Harvie's The Erratics mines the psychological damage wrought on a nuclear family by a monstrous personality. Despite the dark subject matter, this book has a smile at its core, and Laveau-Harvie shows constant wit when depicting some harrowing times. The narrator somehow manages to see all viewpoints, and we are rewarded with an evocative and expansive view of a family that has more than its fair share of dysfunction. The writing throughout is of a consistently high standard and we were constantly delighted by this surprise of a book." "The Stella is a very generous prize—it is a gift of freedom to the winner. I'm going to use this gift to travel to places no one has ever heard of—places like Neche, North Dakota, in the US—to find the traces of a hidden part of my heritage. I hope to find the threads of the next story I will tell, and that the themes of that story will be universal ones. This prize gives me the means to do that. I am grateful to all those who make the Stella Prize possible: for the hard work, belief, and dedication that make it a beacon and a force for good." Read our review of the book.